China’s Leading Bank CICC: Alipay’s blockchain payment system can potentially save Filipino workers HK$100 million a year – We help you think smartly about the crypto and blockchain landscape in Asia 5-10 years out. We help you think smartly about the crypto and blockchain landscape in Asia 5-10 years out. This free preview of Global Coin Research is offered to our loyal readers as a representation of the unique information and insights our members receive weekly. If you’d like to receive all subscription content on our site and via our weekly newsletter, join here! Below is a piece published by CICC Research, a leading local investment bank of China, on their evaluation of AlipayHK, a blockchain-based cross-border remittance service introduced by Alipay late last year. This piece is translated by Global Coin Research. 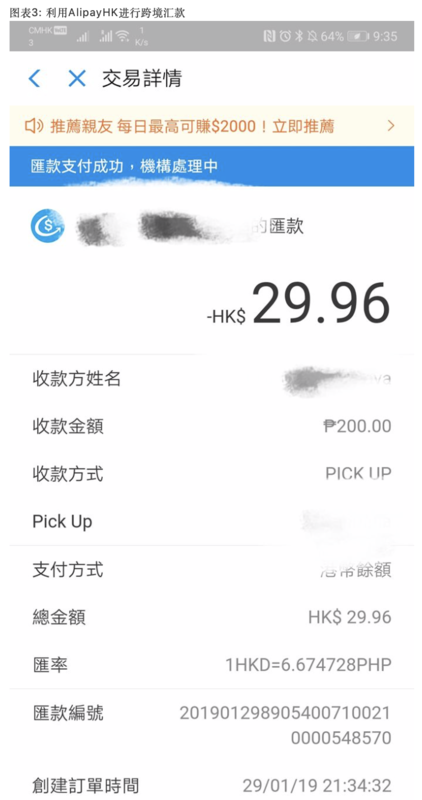 For the first time in Hong Kong, we tried a blockchain-based cross-border remittance service, using AlipayHK for electronic cross-border transfers, and paid part of the monthly salary to Filipino servants. We have found that the use of AlipayHK transfers can provide a more favorable exchange rate than other cross-border remittance methods, without the need to transfer service fees, and the entire transfer process takes only a few seconds, reflecting the good application prospects of blockchain technology in cross-border payments. AlipayHK offers a more favorable exchange rate, saving a total of HK$100 million per year for the Filipino servants in Hong Kong. By comparing the major cross-border remittance methods commonly used by Filipino maids in Hong Kong, including WesternUnion, Worldremit and TNG, we find that AlipayHK has a clear exchange rate advantage. Together with the savings for each remittance (HK$15/transaction), we estimate that each Filipino maid can save HK$500 per year through AlipayHK. For the entire Filipino servant group in Hong Kong (currently 201,090 people), if they all switch to AlipayHK, they can save about HK$100 million a year. In addition, AlipayHK has accelerated the speed of cross-border remittances and is able to arrive in real time 24 hours a day, 7 days a week. Compared with the traditional remittance method, it has a comparative advantage in both time and cost. Cross-border remittance technology based on blockchain may pose a long-term challenge to SWIFT’s monopoly in this area. According to Accenture data, the annual cross-border payment of banks in the world amounts to 25 trillion to 30 trillion US dollars, the total number of transactions is 10 billion to 15 billion, and each transaction costs up to 30-40 US dollars. At present, cross-border remittances mostly use the SWIFT model. Since the payers and payees belong to different payment systems in different countries in cross-border remittances, the intermediate brokerage bank is also required in the SWIFT model. The entire remittance process needs to go through many intermediate links such as remittance banks, remittance central banks, correspondent banks, and collection banks. There are problems such as low efficiency and high handling fees. With blockchain technology, business nodes can be directly connected end-to-end, eliminating a lot of intermediate links, and have the advantage of improving efficiency and reducing costs. Cross-border remittance technology based on blockchain may pose a long-term challenge to SWIFT payment’s monopoly in this area. According to Accenture data, the annual cross-border payment of banks in the world amounts to 25 trillion to 30 trillion US dollars, the total number of transactions is 10 billion to 15 billion, and each transaction costs up to 30-40 US dollars. At present, cross-border remittances mostly use the SWIFT payment system. Since the payers and payees belong to different payment systems in different countries in cross-border remittances, the intermediate brokerage bank is also required in the SWIFT model. The entire remittance process needs to go through many intermediate links such as remittance banks, remittance central banks, correspondent banks, and collection banks. There are problems such as low efficiency and high handling fees. With blockchain technology, business nodes can be directly connected end-to-end, eliminating a lot of intermediate links, and have the advantage of improving efficiency and reducing costs. We are optimistic about the application prospects of blockchain in clearing, cross-border payment, equity/debt financing and regulatory technology. Although bitcoin development has suffered setbacks, blockchain technology has entered the stage of mature commercial applications. As we pointed out in before, blockchain technology has been successfully implemented in many financial sectors. For example, in the clearing and settlement field, the HKEx uses the blockchain settlement system to simplify the northbound trading process of mainland stocks under interconnection. In the cross-border trade finance sector, the Hong Kong Monetary Authority and Ping An Technology launched a trade linkage platform to accelerate the flow of funds in the Greater Bay Area. In addition, governments are actively studying the use of Securitization Issuance (STO) for private equity and bond financing: [In Chinese] Blockchain Research #4: Lessons from the ICO Bubble and STO Development Opportunities. With the spread of stable currencies, central banks have also actively explored the pros and cons of introducing digital currencies:[In Chinese] Blockchain Research #3: Digital Currency and Cross-Border Payments. Blockchain delivers less than expected.